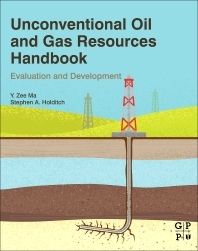 Unconventional Oil and Gas Resources Handbook: Evaluation and Development is a must-have, helpful handbook that brings a wealth of information to engineers and geoscientists. Bridging between subsurface and production, the handbook provides engineers and geoscientists with effective methodology to better define resources and reservoirs. Better reservoir knowledge and innovative technologies are making unconventional resources economically possible, and multidisciplinary approaches in evaluating these resources are critical to successful development. Unconventional Oil and Gas Resources Handbook takes this approach, covering a wide range of topics for developing these resources including exploration, evaluation, drilling, completion, and production. Topics include theory, methodology, and case histories and will help to improve the understanding,integrated evaluation, and effective development of unconventional resources. Dr. Zee Ma is currently a Scientific Advisor in Geosciences and Mathematical Modeling for Schlumberger, specializing in integrated reservoir modeling and hydrocarbon resource evaluation for both conventional and unconventional plays. Prior to joining Schlumberger, he worked for several other major oil companies and service providers for over 28 years in Europe and the US, including Total and ExxonMobil, and served many years as leader for Reservoir Characterization, Static and Dynamic Reservoir Modeling Special Interest Groups. Ma has provided technical consultancy and training for many oil companies and institutions around the world, and has worked on a number of large worldwide projects, including North America’s unconventional oil and gas fields, reservoirs of various depositional environments in West Africa, Gulf of Mexico, Mideast, Canada, South America, and North Sea. Ma has received numerous awards, including the Schlumberger Gold Award and Chairman's Award, and Best Paper from Mathematical Geosciences. He has published numerous papers in geophysics, geology, petrophysics, geostatistics, petroleum engineering, economics, and applied mathematics, and served as the lead Editor of the AAPG Memoir 96. Ma earned four degrees - a Ph.D. in Mathematical Geology, Geostatistics, and Remote Sensing from the Institute National Polytechnique de Lorraine (France), a M.Sc. in Geostatistics from the Ecole National Superior de Mine de Paris (now ParisTech), a M.Sc. in Geologic Engineering from University of Lorraine in France, and a B.Sc. in Geology from the China University of Geosciences. Stephen Holditch is currently a retired Professor Emeritus for the Department of Petroleum Engineering at Texas A&M University with a 39-year long career in the oil and gas industry. Prior to retirement, he was the Director of the Texas A&M Energy Institute from 2011-2013 and was the Head of the Harold Vance Department of Petroleum Engineering at A&M from 2004-2012. Prior to his contributions in academia, he formed his own consulting firm, S.A. Holditch and Associates, specializing in tight gas, shale, and coalbed methane projects. Schlumberger purchased the company in 1997, and Holditch was named a Schlumberger Fellow from 1999 to 2004. Stephen served as SPE President from 2001-2003 and a member of the Board of Directors for SPE for several years. Stephen earned his Ph.D., M.S., and B.S. degrees all in Petroleum Engineering and all from Texas A&M University. He has received many awards throughout his career, including election into the National Academy of Engineering, SPE and AIME Honorary Memberships, and was recently named a Distinguished Alumnus from A&M in 2014. Stephen is associated with many organizations, including SPE, AAPG, SPWLA, and he is a registered professional engineer in the state of Texas. He has also written numerous papers, including one of the first editorial pieces in Elsevier's Journal of Unconventional Oil and Gas Resources. An essential book for anyone interested in the world of unconventional reservoirs. The content and its illustrations are comprehensive. A reference book for academics, engineers, geologists, economists and entrepreneurs.